Lopez is a life-long traveler. He travels not for the simple pleasure of new experiences nor even for the aesthetic pleasure so readily available, though he evokes the wonder of the places he visits with true feeling, but more out of a sense of ethical obligation, as a writer, to experience the world intensely and then to put into words as well as he can what he’d seen: ‘I saw myself, then, as a sort of courier…come home from another land after some exchange with it and its denizens, carrying…some bit of news about how different, how marvelous and incomprehensible, really, life was, out beyond the pale of the village in which I had grown up.’ From his home on the west slope of the Cascade Mountains in Oregon, he has traveled with Aboriginal people in the Northern Territory of Australia, with a group of Kamba men in Kenya searching for hominid fossils, up the Orinoco River in Venezuela, through the Queen Maud Mountains of Antarctica, down the Yangtze River in China, explored the cliff walls at Bamyan in Afghanistan – everywhere evoking both the joys and horrors of the world and of how we live in it. His sensory openness begins in his memory of being a child: wading out into the salt water of Long Island Sound or, short years later, into the retreating waves of a beach near Malibu where the ‘temperate air embraces him [and] an offshore breeze softens the burn of the sun’s ray on his white skin…. This is new to him, a feeling of being cradled in harmless breezes and caressed by light. Years later, walking alone in faraway places, he will remember and long for this sensation.’ The landscape of happiness. Of happiness in the moment but, also, an awakening to the dread of what man has done and can do. ‘What is going to happen to all of us now, in a time of militant factions, of daily violence?’ This existential realization comes as the author, now nearing 70, is sitting on a beach in Hawaii with his wife, enjoying the exuberance of their grandson swimming in the ocean, a day which had begun with a visit by him and his grandson to the USS Arizona memorial. Along with the writer, we experience this illuminating fear as natural, induced by the juxtaposition of simple human pleasure with that all-too-vividly physical reminder of the horrors inflicted on man by man. 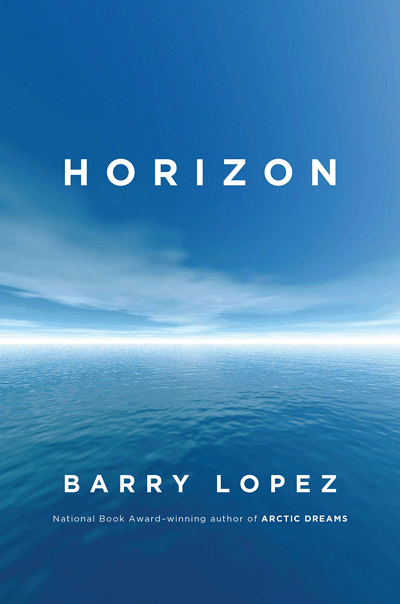 Lopez’ approach to nature is meditative; he reads its lessons for human behavior; often, he finds what he observes to be a warning. His insightful commentary is a gift. But, more often than he should, he ratchets his dire judgmental outcries up to truly apocalyptic levels. Overkill sets in. In a food market in rural China, amongst the displays of dead crickets and caterpillars and racks of small birds for sale, he suddenly visualizes ‘the future, the years to come, when we would begin killing and consuming every last living thing.’ No, not really. In the same way, he can selectively dramatize past inhumanities. He recalls, justifiably, the ‘indifference to catastrophic human suffering’ in the Iran of the Shah but not the Iran of the ayatollahs nor the Iraq of Saddam Hussein. He is also prone to breast-beating near-hysteria and a rewriting of history. No, Pinochet was not ‘installed’ by the United States. Here, a certain recognition of the determination of people to control their own destinies would be helpful. Very much on the other, rational side of his historical judgment would be his revalidation of Captain Cook – against the PC vilification of him as just one more invasive white man – as ‘the great nautical chart maker of his time,’ particularly in the vast reaches of the Pacific Ocean, enabling us, for the first time ever, ‘to picture the entire planet, the whole of it at once.’ This levelheadedness is welcome, indeed, as is Lopez’ graceful practice of weaving into the narrative of his inter-actions with the natural world many such factual mini-essays on historical figures, including such differing races of prehistoric man as the Thule or the Dorset, or music and musicians or art and artists or science, writ large. Still, it would be helpful to encounter, in his musings, a more realistic awareness of our ability to effect genuine changes in our behavior, particularly our treatment of our planet, an appreciation of the durability of what the hard slog of democracy can bring about. Such desiderata aside, there abide Lopez’ sheer wonder at the world around him, his glorious ability to evoke its physicality on the page, and his commitment to his continuing journey of ‘ardently searching for coherence, for a way to fit all the pieces of our life experience together into a meaningful whole, to find a direction in which to continue.’ We, his readers, are privileged to journey with him. This is a very long book – one wishes it were much longer.